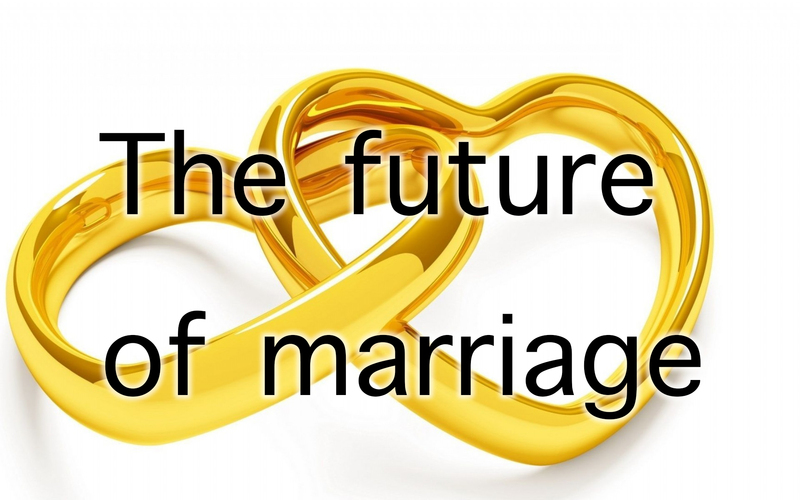 What will marriage look like in the future? It was the first week of fall semester. I was walking around the college campus getting paper work done for various things when I walked outside and seen the most beautiful girl i’ve ever seen in my life sitting at a table filling out paper work. With a pocket full of pens and a head full of confidence I walked over to her with the line “Hey, i need to fill out this paper for the dean but I don’t have anything to write with, can I borrow a pen?”. She replied “yes, you can use this one.” and there I was, sitting next to my future wife and neither of us knew it. Marriage, also called matrimony or wedlock, is a socially or ritually recognized union between spouses that establishes rights and obligations between them, between them and their children, and between them and their in-laws. The definition of marriage varies according to different cultures, but it is principally an institution in which lasting interpersonal relationships are acknowledged. In the future marriages will be defined as a smart contract that establishes a civil union between one or more consenting identities. The civil union will help define property ownership, marital responsibilities and what happens in the event of marriage termination. Smart contracts are computer protocols intended to facilitate, verify, or enforce the negotiation or performance of a contract. Smart contracts were first proposed by Nick Szabo in 1994. Proponents of smart contracts claim that many kinds of contractual clauses may be made partially or fully self-executing, self-enforcing, or both. However, the term is a little confusing because smart contracts in their current embodiment are neither smart nor are they contracts, but rather dumb scripts interpreted and executed by distributed state machines. Even a distributed state machine sounds more confusing than it really is. Distributed state machines are virtual machines that execute code stored on a distributed ledger. Even though smart contracts are neither smart nor contracts they are still pretty damn exciting. The reason smart contracts are so exciting is because you can create digital representations of traditional contracts in this case marriage. The traditional workflow of marriage goes like this, two people agree to get married, they travel to their magistrate, conjure up a piece of paper, both sign it and tada, they are married. If the contract has any special terms and conditions like pre-nump, or who owns what property, or who owns the contents of the bank accounts it is up to some third party to establish, interpret and enforce them. With smart contracts all terms and conditions will be established in code preemptively. The marriage contract could then look more like a shared bank account with customized functionality. Both parties could deposit tokens into the contract that represent their property managed jointly. Upon divorce the properties would be split according to the terms determined in the beginning. All with out the need for someone to interpret said terms. Because the terms are code. Code that can only return true or false statements. If predetermined requirements are met, the contract returns true, else it returns false. All terms of the contract could be settled in a binary way. Smart contracts marriages are better than traditional marriages because they replace ambiguity with mathematical certainty and thats a win for everyone.